The Mother of Good Counsel Votive Chapel, visible upon arrival at the Shrine site. 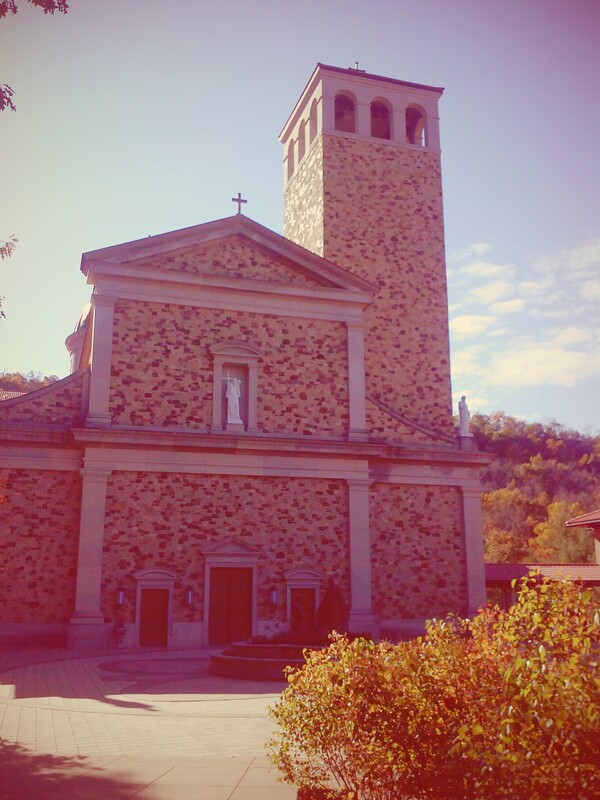 TUCKED INTO A HILLSIDE just south of La Crosse, the Shrine of Our Lady of Guadalupe draws modern day pilgrims seeking solace, peace and hope. 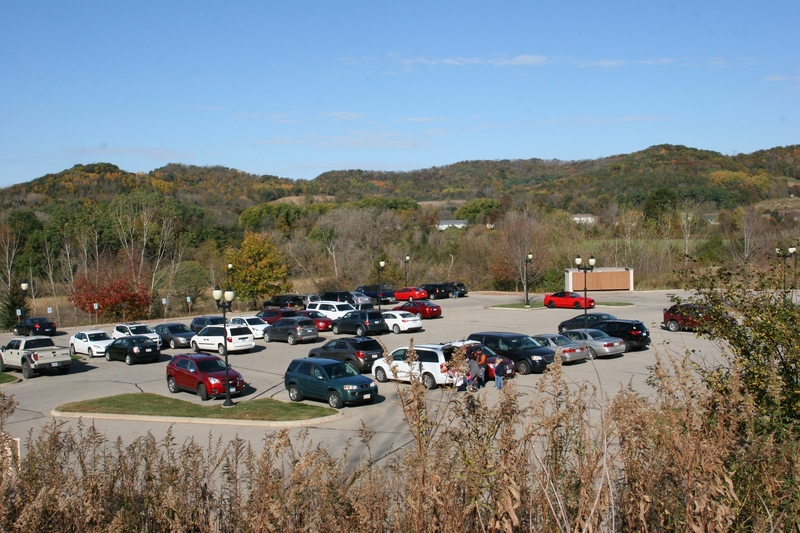 This view of the parking lot shows the scenic rural setting. How this shrine came to be in rural Wisconsin traces to the desires of a Bishop and of a family to create a place that would bring people closer to God. 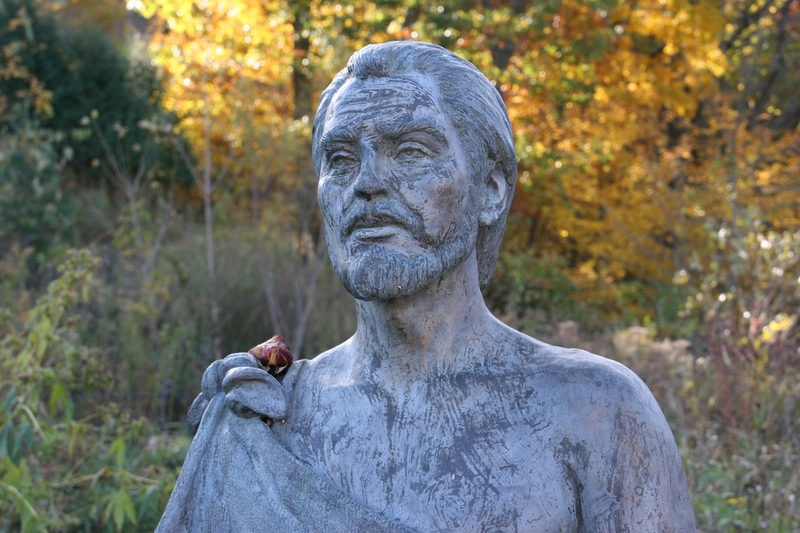 This sculpture of Juan Diego stands near the Pilgrim Center. 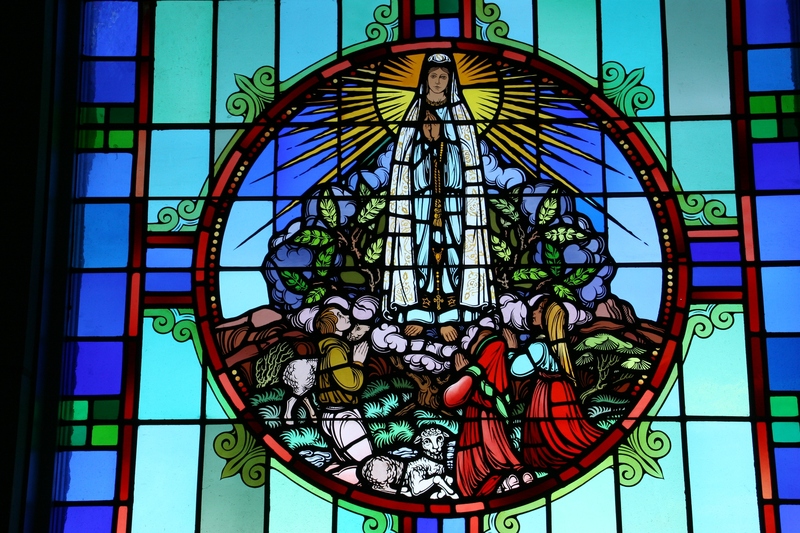 To summarize, in 1531 Aztec convert Juan Diego five times witnessed apparitions of the Blessed Virgin Mary. His uncle, Juan Bernardino, reported that she had cured him and was thereafter to be known as Santa Maria de Guadalupe. 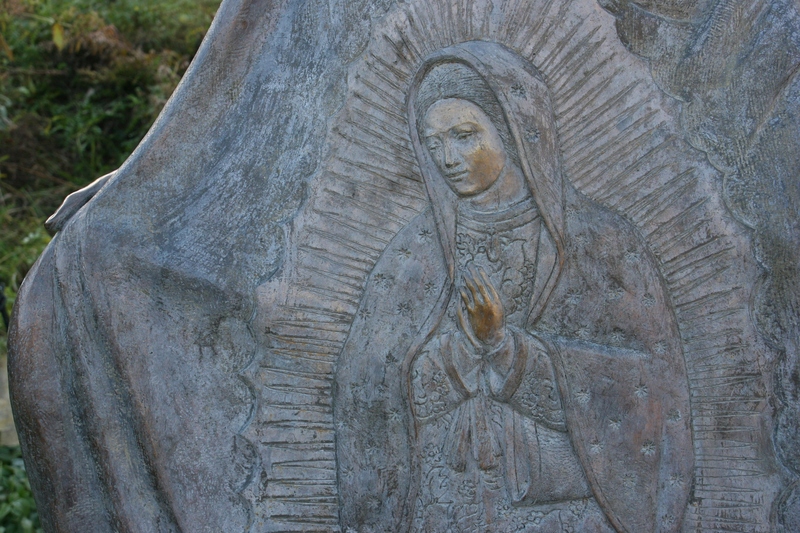 This image of Our Lady of Guadalupe is woven into the Juan Diego statue. I am not of the Catholic faith. Therefore I do not understand the intricacies of Juan Diego’s story. But I glimpse his significance to those, especially, of Hispanic heritage. Juan, a native of Mexico, is the first Roman Catholic Indigenous saint from the Americas. 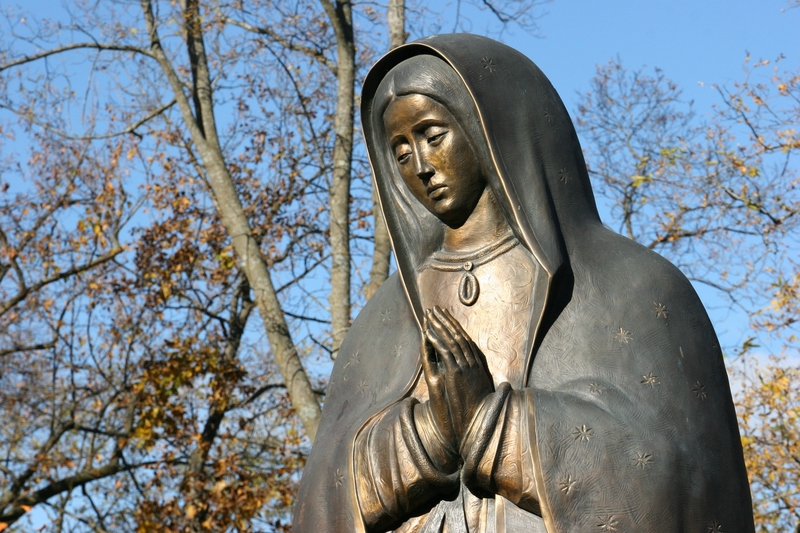 Outside the Pilgrim Center rests this sculpture of Our Lady of Guadalupe. When I recently visited the Shrine of Our Lady of Guadalupe in Wisconsin, visitors of Hispanic origin outnumbered all others. 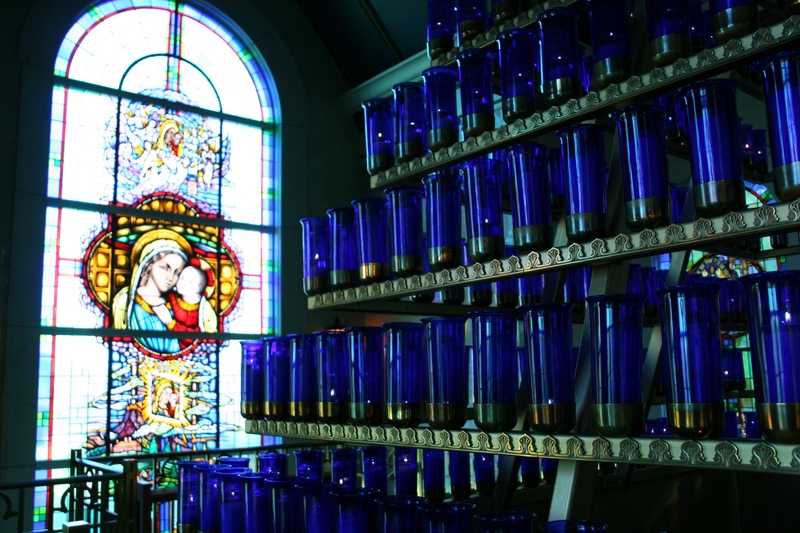 A rack holds 576 candles inside the Mother of Good Counsel Votive Chapel. Visitors, for a price, may have a candle lit. A lift allows lighting of the tiered candles stretching high into the chapel. But, no matter your ethnicity or religion, this worshipful setting distances the distractions of life, replacing them with hope and serenity. 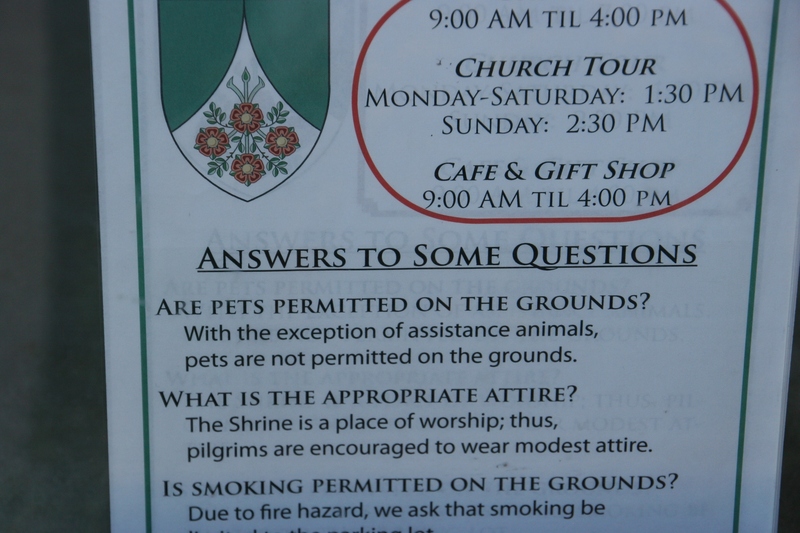 Some of the “rules,” posted on a window outside the Pilgrim Center entry. 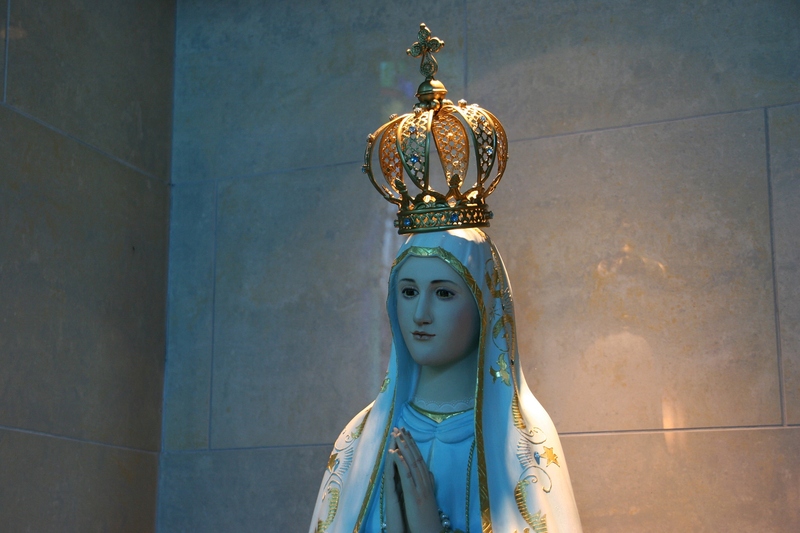 Another chapel statue, of, I assume, the Virgin Mary. The scent and heat of burning candles prevail in the chapel. 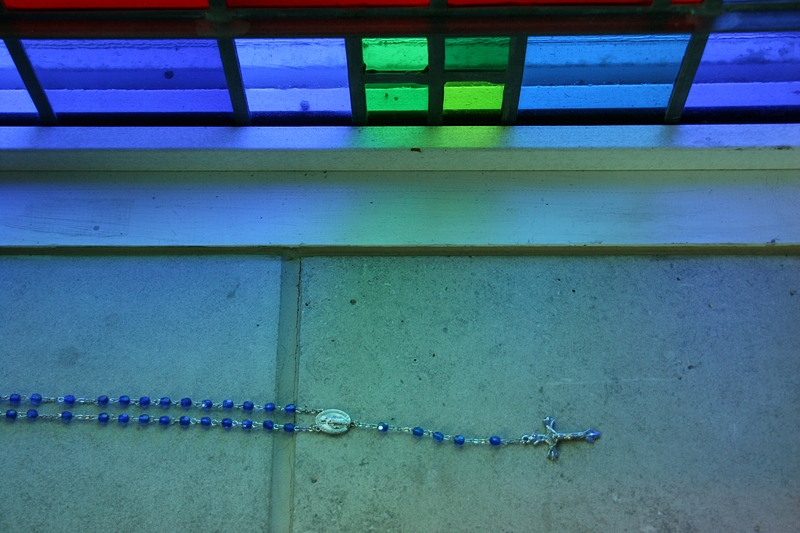 Rosary beads on a chapel window sill. 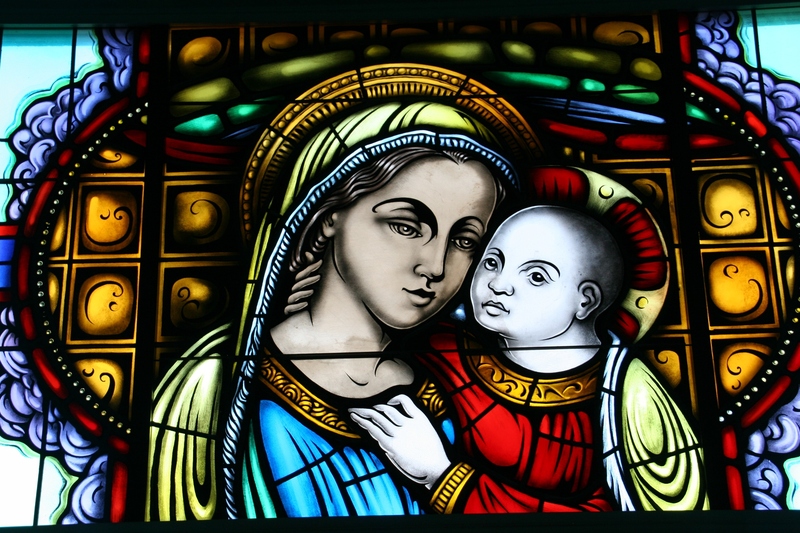 The stained glass windows in the chapel are exquisite. 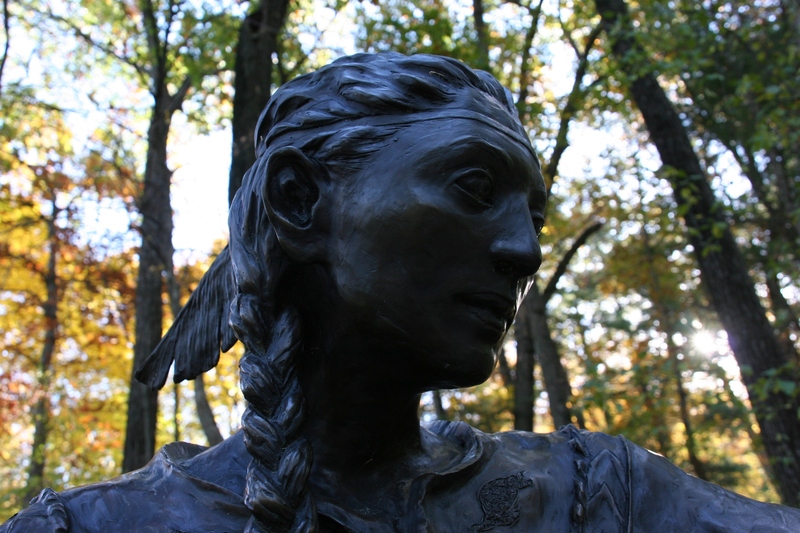 Up the path from the chapel, a statue of the first canonized Native American, Saint Kateri Tekakwitha. The path winds up the hill toward The Shrine Church and other attractions. Golf cart rides to the Shrine are available. The Shrine Church. Photo courtesy of Miranda Helbling. Inside the Shrine Church, constructed between 2004-2008. Photo courtesy of Miranda Helbling. Art abounds inside the Shrine. Photo courtesy of Miranda Helbling. 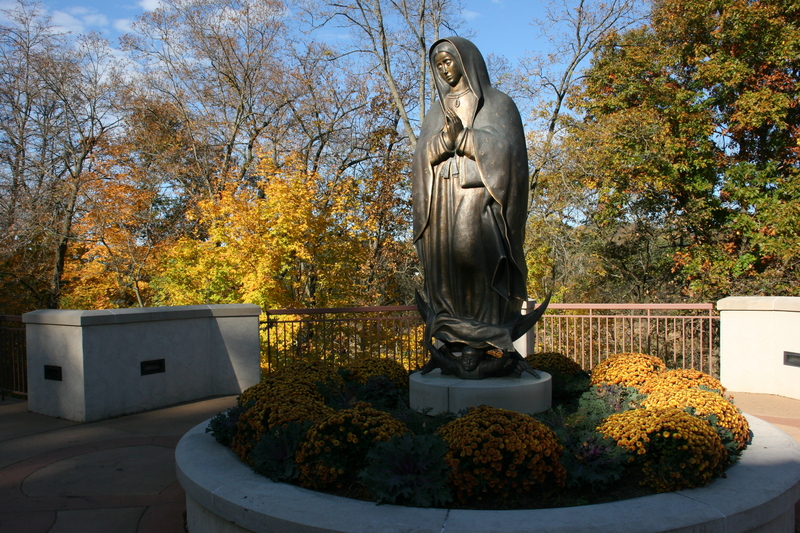 The Memorial to the Unborn celebrates and honors the lives of the unborn. Photo courtesy of Miranda Helbling. 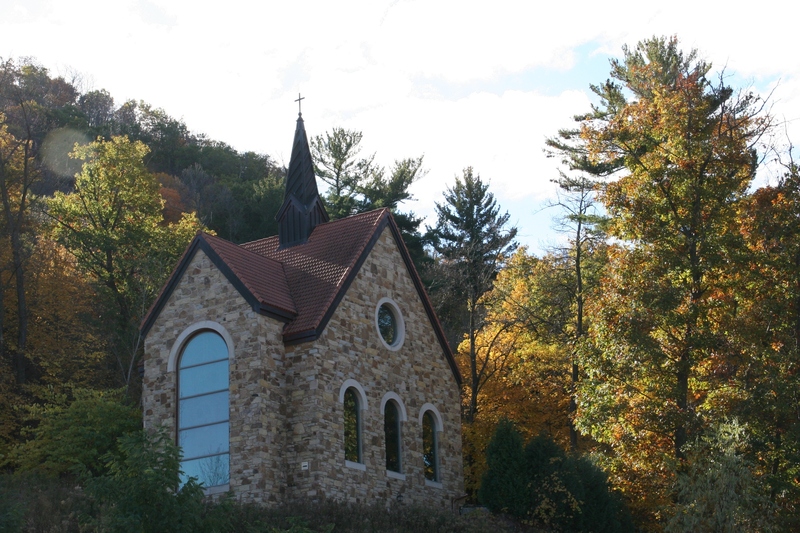 FYI: This religious site just outside of La Crosse includes many attractions such as the Pilgrim Center (with cafe and gift shop), Mother of Good Counsel Votive Chapel, The Shrine Church, Stations of the Cross, Rosary Walk, Devotional Areas and the Memorial to the Unborn. Click here for more information. What a beautiful place to spend some time. How could you not feel reverent and contemplative while walking amongst this beauty? It is a lovely setting that evokes a sense of peace. Beautiful and Serene – thanks so much for sharing this place – great captures 🙂 Happy Week! Those are two fitting adjectives. I tried to comment this morning, but I didn’t think it “took” and, indeed, I see it didn’t. 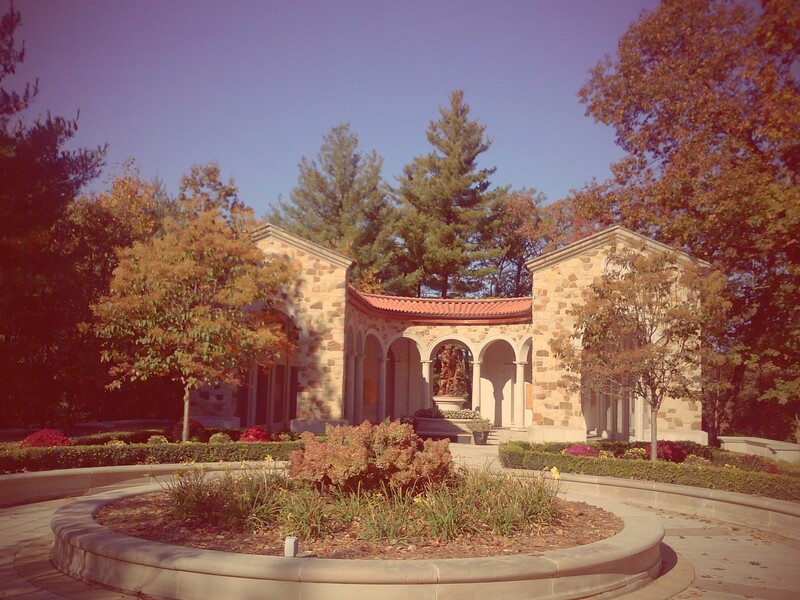 I like the little chapel very much. 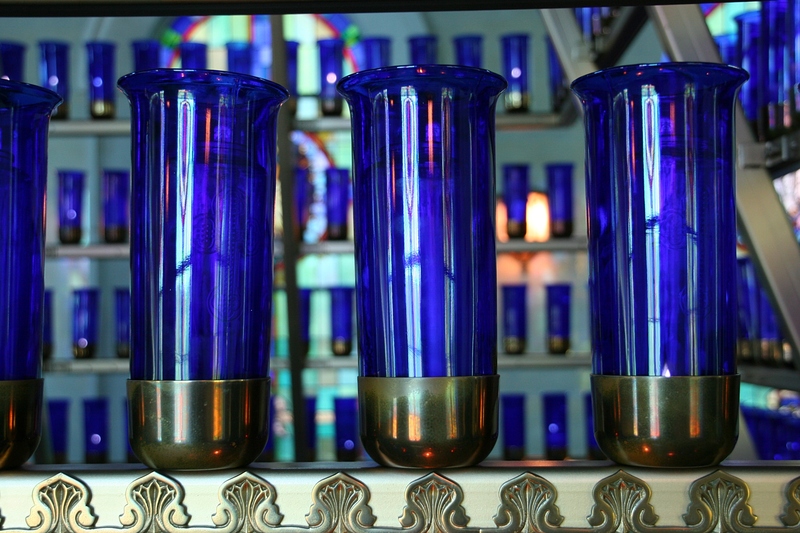 The stained glass and the blue votives. I’m not a religious person, but I love churches. So tranquil and quiet. I think I like cemeteries for the same reason. I’m sorry your comment didn’t post this morning. Who knows how technology works sometimes? Oh I’m so glad you got to this awesone Shrine, Rick and I were there a few years ago…so peaceful and beautiful! 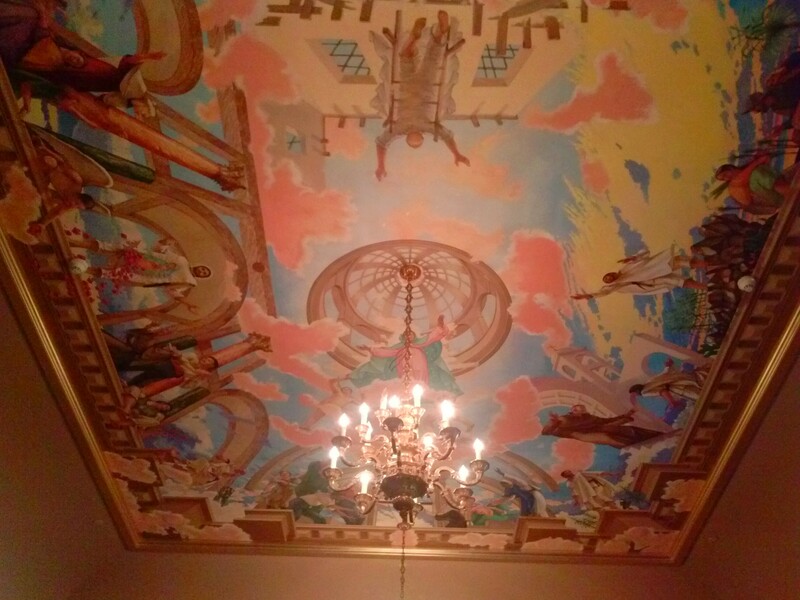 A great setting and beautiful art. I had never heard of Saint Kateri Tekakwitha before this post and I was likewise not aware of a native American saint. I will have to look up her history, Thanks for sharing this info with your readers Audrey. You are welcome. I didn’t know about any of these saints or about any of this either, so a learning opportunity for me also. Lovely place and I have never heard of the shrine or church. Your photos captured the serenity and beauty. I noticed the sign Saint Kateri Teckakwitha. Thanks for that additional info, Sue. 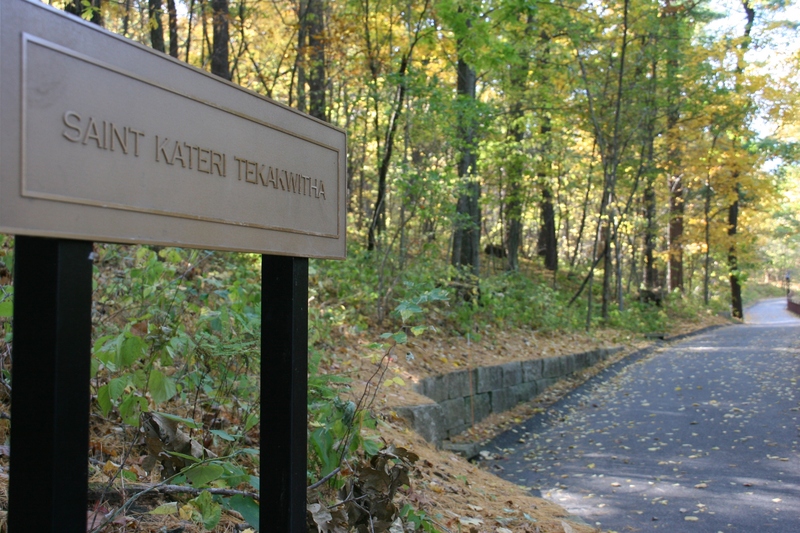 Since I live in Native American territory, and I used to attend the Catholic church here, I am very familiar with St. Kateri Techakwitha (although she had not been canonized yet at that time). Your photographs are beautiful… very soothing! Thank you. I learned a lot by visiting the shrine and from comments. Love the place, so beautiful. You would definitely appreciate the Shrine given your deep interest in churches. 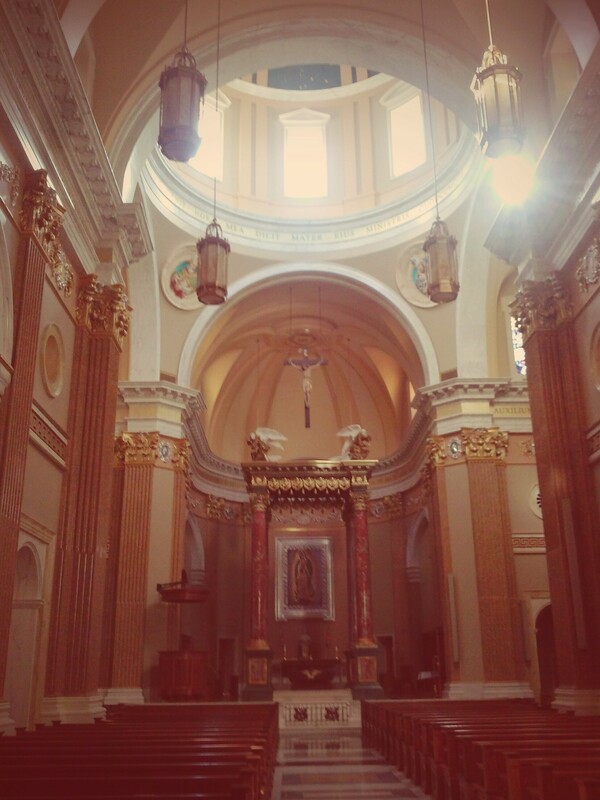 Beautiful church…Places like this are so peaceful. I believe you captured it perfectly.